This article describes how to create a helper in an ASP.NET Web Pages (Razor) website. A helper is a reusable component that includes code and markup to perform a task that might be tedious or complex. How to create and use a simple helper. If you need to perform the same tasks on different pages in your site, you can use a helper. ASP.NET Web Pages includes a number of helpers, and there are many more that you can download and install. (A list of the built-in helpers in ASP.NET Web Pages is listed in the ASP.NET API Quick Reference.) If none of the existing helpers meet your needs, you can create your own helper. A helper lets you use a common block of code across multiple pages. Suppose that in your page you often want to create a note item that's set apart from normal paragraphs. Perhaps the note is created as a <div> element that's styled as a box with a border. Rather than add this same markup to a page every time you want to display a note, you can package the markup as a helper. You can then insert the note with a single line of code anywhere you need it. Using a helper like this makes the code in each of your pages simpler and easier to read. It also makes it easier to maintain your site, because if you need to change how the notes look, you can change the markup in one place. This procedure shows you how to create the helper that creates the note, as just described. 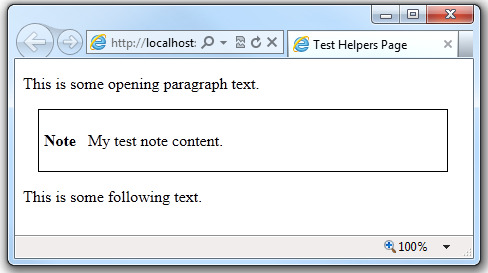 This is a simple example, but the custom helper can include any markup and ASP.NET code that you need. In the root folder of the website, create a folder named App_Code. This is a reserved folder name in ASP.NET where you can put code for components like helpers. In the App_Code folder create a new .cshtml file and name it MyHelpers.cshtml. The code uses the @helper syntax to declare a new helper named MakeNote. This particular helper lets you pass a parameter named content that can contain a combination of text and markup. The helper inserts the string into the note body using the @content variable. Notice that the file is named MyHelpers.cshtml, but the helper is named MakeNote. You can put multiple custom helpers into a single file. Horizontal menu as a Razor helper. This blog entry by Mike Pope shows how to create a horizontal menu as a helper using markup, CSS, and code. Leveraging HTML5 in ASP.NET Web Pages Helpers for WebMatrix and ASP.NET MVC3. This blog entry by Sam Abraham shows a helper that renders an HTML5 Canvas element. The Difference Between @Helpers and @Functions in WebMatrix. This blog entry by Mike Brind describes @helper syntax and @function syntax and when to use each.